When it comes to breaking a record, no one does it with more style than Ronnie O'Sullivan. Not for him the easy, the straightforward, the trouble-free. When he reached 99 in the final frame of the Players Championship in Preston on Sunday and faced the possibility of becoming the first snooker player to make 1,000 century breaks, he stopped for a moment and allowed a cheeky grin to spread across his face. Instead of removing all possibility of failure, he changed his grip and went for the pot left-handed. A serial gambler, here he was on the very lip of immortality, flavouring the occasion with a peppering of risk. Not that there was really any doubt. Even the wrong way round, O'Sullivan could pot balls in his sleep. To put O'Sullivan's achievement into perspective, Stephen Hendry, the next in line when it comes to century breaks, recorded 775. Mark Williams, the current world champion, has 460. Across his 25-year professional career, O'Sullivan has played 1,257 matches, which means he averages 0.79 centuries a match. In other words, three out of four times you watch Ronnie play, he will record a century. 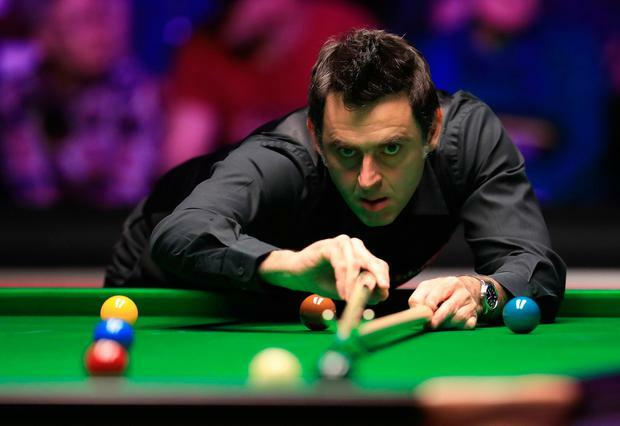 Naturally he has more maximum breaks than anyone else: 15 of them, including the fastest-ever, timed at an astonishing five minutes and 20 seconds. The doubt disappeared long ago that O'Sullivan (below) is the greatest player ever to pick up a cue. Alone among peers, the chance to watch him in action justifies the entrance fee to any tournament, any time, anywhere. And that in itself is a problem. That was why, even as he turned to the left to sink that magical pot, there was a significant sense of poignancy about his record-breaking achievement. Because Ronnie O'Sullivan is now 43. True, after quelling his internal demons, he's playing as well as ever; on his way to picking up five ranking titles last season he compiled no fewer than 74 centuries. There was a suggestion of the fear of what his departure would bring about in the sport last December. Weary of the relentless grind of the tour, unhappy with the contractual obligation to turn up for second-rate tournaments in third-rate venues, he hinted at a breakaway. Claiming he had financial backing, he mooted the idea of a Champions League-style tour, established solely for the big names. Barry Hearn, the ever-cunning ringmaster of the sport, responded with typical vigour. But you knew, even as he insisted he would bring the full weight of authority down to ensure no such breakaway would happen, that Hearn's room for manoeuvre was limited. Anyone else and he would have fined, banned, expelled them. But he could not do anything so rash. He knows O'Sullivan is his one true box-office star. He knows how much the sport needs its principal attraction. Ronnie O'Sullivan became the first player to make 1,000 career century breaks after successfully defending his Coral Players Championship title with a convincing 10-4 victory over Neil Robertson. Independent.ie Newsdesk Ronnie O'Sullivan celebrated victory over Barry Hawkins in the Coral Players Championship in Preston by attempting to talk in a bizarre Australian accent in his post-match interviews. Roy Hodgson insists Wilfried Zaha is happy at Crystal Palace.